Dark Horse is rolling out a fresh series for the New Year that is bound to be a hit. Issue #1 certainly portends some great things as our favorite Cimmerian meets up with the fabled she-devil with a sword. Yes, it’s Conan the Barbarian and Red Sonja, co-written by Gail Simone and Jim Zub with stellar artwork by Dan Panosian. Gail Simone, of course, has a storied career, writing for such titles as Birds of Prey, Secret Six, Batgirl, Wonder Woman and of course, Red Sonja. I have a signed copy of her JLA graphic novel The Hypothetical Woman from a convention appearance I attended in Portland a while back and she’s a complete delight. Bryan Stroud for Comics Bulletin: The cover proudly proclaims it’s a licensed Robert E. Howard product. Are there restrictions in dealing with a licensed character such as Conan? Jim Zub: It’s like any other work-for-hire project, there’s an approval process throughout the pipeline that’s there to maintain the integrity and quality required by the license holder. In many cases they’re just double checking that we’re not doing something extremely out of character and that any locations we use are properly referenced. As a lifelong Conan fan I felt pretty confident we could hit the mark in terms of mood and characterization. Gail Simone: They’ve actually been pretty great. I am not usually dealing with them, as Sonja is owned by another licensor, but they were on board with the scope and sweep of the thing, which is what we were most concerned about. We are treating this as canon, Sonja and Conan’s first meeting. CB: Gail, this is not your first foray into Red Sonja stories, but unless I’m misinformed, you’ve not tackled Conan before. Was there much of a difference in your approach? Simone: There are so many filthy jokes I could make here! I would have to say Conan’s a little more head-on than Sonja. I love those primal characters; I really enjoy that steely-gaze-of-doom-if-you-cross-him type. Conan has been an influence on several characters I have written or created over the years, it’s a blast to get to write him. I want the Conan who you don’t invite to dinner parties. I like Conan to not be polite. That’s the guy that’s fun to write. CB: In the first issue, they seem to have struck an uneasy alliance, but I absolutely love the line when Conan is challenging Sonja with: “You would steal that which we took by good, honest theft?” Are you primarily doing dialogue or is it Jim Zub? Simone: We took turns, that was the fun of it, and I was taking cues from Jim’s Conan, and he was doing the same with my Sonja…I think in some parts, it’s very difficult to tell who did what. But we did several passes over each other’s pages and I honestly don’t think we had a single cross word about it, we both just wanted the best possible script. We knew this had to be epic. So Jim would say, “I am not sure about THIS line,” to something I’d written, and dammit, he’d be right, so we made it better over and over. Just good fun. CB: So you’ve got a story featuring two supremely confident Alphas. Is that your natural tension for the story or is there more? Zub: The clash between Conan and Sonja and the way their personalities differ is obviously part of the conflict, but there are a slew of external threats as well. We really put them through the wringer. As far as romantic tension goes, Gail likened it to a pair of Olympic athletes. These are two extraordinary people in their prime and they see those ‘Alpha’ qualities in each other. It’s both threatening and alluring at the same time. Simone: Well, they’re two single-minded, slightly selfish, violent and randy rogues. And between them, they wear about eight sheets of Charmin. There’s a lot of stuff in the mix and they are not exactly shy. It’s a ton of fun pitting them against each other. There’s serious stuff in the story, but if you think we are throwing those two at each other without some friction, you are mistaken. CB: How do you divide writing tasks? Zub: Gail and I brainstormed a bunch of overarching story concepts and put together a wish list of things we wanted to have appear in the story if at all possible, then started structuring out a story from there. Gail had the brilliant idea of building a threat that carries out over many years so Conan and Sonja meet up at three different times. That way we get to see them getting older and changing, and we didn’t have to only show one era of this legendary duo. From there we did up a scene pacing sheet for each issue and then scripted it like a tennis match, writing 5-6 page sections and sending them back and forth, making small adjustments as it went along and then doing a final dialogue edit once each issue was finished and approved. Simone: I did a parcel, then he did, then I did. If someone had a bit they REALLY wanted to do, we sort of called dibs. Surprisingly, the tricky part was often stopping for the next runner to take the baton. It was fun enough that we both just wanted to keep going! CB: Is the co-author format enjoyable for you? Simone: It was, it was great fun. I had a rough year personally, and that did unfortunately slow me down, but Jim was absolutely wonderful and I owe him huge. I am delighted with the book, and it came out 50/50%, just as we had hoped. Having another writer forces you to make sure your plots are solid, you can’t hide a weakness if you have to explain your plan. We broke up each issue in overviews, then page breakdowns, then we each took turns scripting. It was really an adjustment, but the end result is one of my favorite stories I’ve been involved with, ever. Zub: It’s been a completely new challenge for me. I’ve learned a lot by seeing how Gail works. She has a really strong instinct for storytelling and knows how to inject a lot of powerful emotion into a scene. I don’t know if I’ll get the chance to work with someone like this again, but it’s been a really neat experience. CB: Do you find it easy to write for a period setting or does it require some research? Simone: I did a bunch of reading of Hyboria when I started Sonja, just huge chunks of research. Now I do spot research to refresh about settings and such. Jim is excellent at that, which was very helpful. 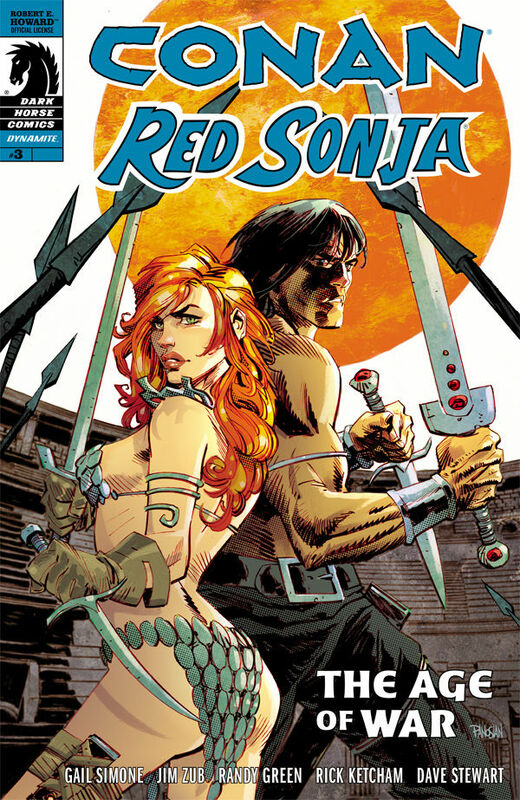 Zub: Conan and Red Sonja inhabit Hyboria, a fictional sword & sorcery world, so it’s less about historical accuracy and more about what’s “setting appropriate”. Years of reading Conan stories, playing Dungeons & Dragons, and writing fantasy comics prepared me well. CB: I noticed this is a 4-issue arc. It seems many are 6-issues. Was this a choice by editorial? Do you like the mini-series format or is it constricting? Zub: Four issues was always the plan as far as I know. I’m not sure why that was chosen over 6, but when it comes to work-for-hire you tell the best story you can with what you’ve got. Once you know the page count and format you mentally build a story to use that size effectively. Having a self-contained story is nice since you know it all needs to wrap up in some way by the end. I find ongoing serialized stories a bit more challenging because of the constant plot churn happening issue by issue and arc by arc. Simone: I honestly don’t remember, but I know we wanted it to have a big, epic sprawl and punch. I would rather come in and jab to the face, then hang around past our welcome. It’s Conan and Red Sonja; we wanted to get to the good stuff immediately. There’s no flab, stuff is happening from page one. CB: Gail raves on Facebook about Dan Panosian’s artwork. I’m similarly impressed. How much detail is provided in the script? Zub: I don’t know what Dan’s used to from other writers, but Gail and I try to provide ideas for “action choreography” without telling him how to do his job. The script is meant to inspire the artist to deliver their best on the page and, from what Dan’s told us and the quality of pages he’s been putting together, I think it’s all working well. When it comes to writing scenes I try to focus on elements that matter to the storytelling – what’s happening overall, the dialogue, and how should the reader feel about it, rather than micromanaging every last detail. CB: Gail, with Dan’s work do you feel it’s been collaborative or just a happy discovery when the pages are done? Simone: Totally the latter. We didn’t really see much of his work upfront, just some designs. Then the pages came in and holy crap. I have been raving about this like a June bug for months now, but it’s STUNNING. And the colors by Dave Stewart just make it better. They lifted our book up. The look is part classic, part modern. It’s a gut punch. CB: What sort of things do you have to take into account when writing about a couple of what could arguably be called mercenaries or perhaps anti-heroes? Simone: Those are my favorites! I think the point is to remember that they are not traditional heroes. They don’t operate out of endless selflessness. They are operating off of their guts and groins, really. Zub: Anti-heroes are complex and morally fluid, and that provides tons of interesting scenarios for conflict. Making characters appealing is not the same as making them “nice”. All of us can be selfish, bull-headed, or foolish and the key is to present those negative qualities in a way that the reader understands and can still engage them. 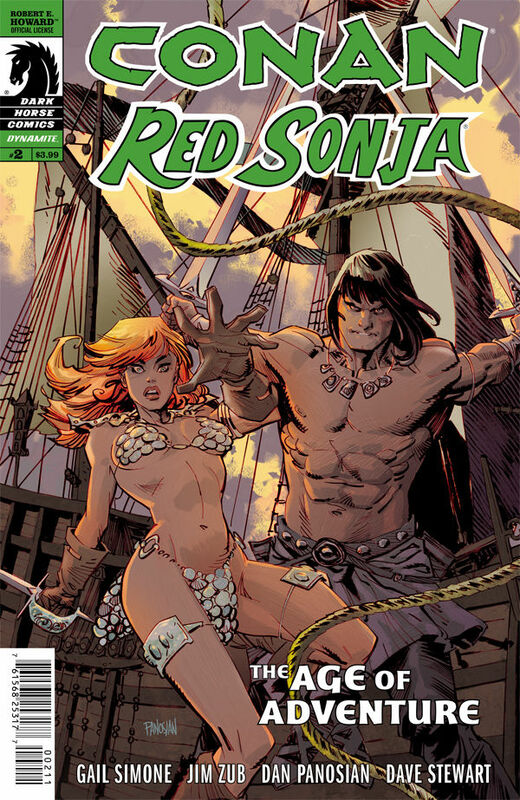 Conan and Red Sonja are intriguing and empowering even when they’re not acting very heroically. CB: Without getting into spoiler territory what can the fans look forward to? Simone: What I was really thinking of was those great DC/Marvel crossovers, the early ones, that treated each book like an event. That’s what we were shooting for…it couldn’t be just another hack and slash thing. So this is a story about the first mighty biological weapon, really. That’s all I can say. Zub: Epic battles, sweeping settings, and intense emotion as two of biggest and best characters in fantasy are drawn together to battle an insidious threat that grows in power with each encounter. CB: What do you feel is the most important part of the writer’s craft? Zub: I always try to create a story that I myself would enjoy if I was the reader. Satisfying my inner muse tends to also satisfy readers who enjoy my writing sensibilities. You can learn all kinds of structure and technique, and those things can be very helpful, but if you’re not telling a story you yourself would enjoy then it’s going to end up hollow. Simone: Overall? I feel like it’s the connection between reader and storyteller. I feel like we’re directly connected to cavemen sitting around campfires in that way and I do love that. In comics, I feel very much the ghosts of the geniuses who came before us, who built what we all love so much. I’m sure this sounds a bit silly, but with this particular project, it fits. We are here telling stories of characters popularized in the seventies, who were created in the thirties, who themselves are inspired by warriors from a dozen eras and nations. It’s kind of lovely. You have to take it seriously; you have to care about doing it to the best of your ability. Having a story that the reader can’t wait to finish, but hates to finish at the same time, that’s a wonderful feeling. CB: Is there anything I failed to ask that you’d like to mention about this new series? Zub: Everyone on the team has been firing on all cylinders for this. I can’t wait to see what people think of our efforts. Simone: People should get it. Even if you don’t read it, the art is PHENOMENAL. But you should read it, weirdos!